With spring approaching the competition to generate photographs for the 2020 village calendar is drawing closer. The Community Council welcome photographs taken in recent years, which represent our beautiful parish and our thriving community. There is no age limit and we would love to have more entries from young people, the aim is to make it an enjoyable community project. The photographs, reflecting any of the 12 months of the year, may include scenic views, architectural and natural features, street scenes and any seasonal or unusual aspects of the parish. Community events and society activities would also be appreciated. The competition to find twelve suitable photographs will be staged, as previously, on Bank Holiday Monday 6th May in the Church Hall and all the entries will be on public display during the afternoon, from 1pm-4pm. This year visitors will be invited to choose the photographs to be included in the 2020 calendar. 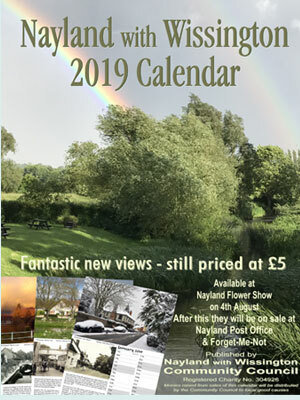 A few copies of the 2019 calendar are still available in village shops; Nayland Post Office and Forget Me Not or from 17 Court Street. 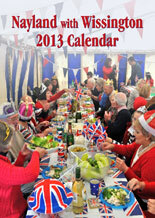 For anyone interested, a few calendars from previous years are also available @ £2.50. The stunning photographs in the 2019 calendar provide a wonderful record of the parish as it is today. They represent the diverse activities in our active community and reflect the beauty of the village and its surrounding landscape. In addition, an older image relating to each modern scene is included with historical notes by Wendy Sparrow, the Parish Recorder. 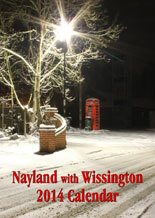 Wendy has also included a history piece entitled ‘When Peace Came to Nayland'. 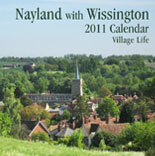 A village calendar for Nayland with Wissington has been produced by the Community Council since 2010. Following a suggestion by Hazel Gardiner in 2008 a sub-committee was formed to bring the idea to fruition. Members of the committee for the first calendar were: Hazel Gardiner, Lorraine Brooks, Wendy Sparrow, Jenny Smith and Chris Hunt. More recently the team includes, Hazel Gardiner, Lorraine Brooks, Wendy Sparrow, Colin Ramsell, Pat Bray. A photographic competition, open to anyone living or working in the parish, is held each May to generate the photographs for the twelve months and a front cover. For each month the modern photograph is accompanied by an older image and historical information. The stunning photographs which have been entered in the competitions have made judging very difficult for the professional photographer requested to fulfil this task. The images have been excellent and such a superb reflection of our parish, its character and landscape. 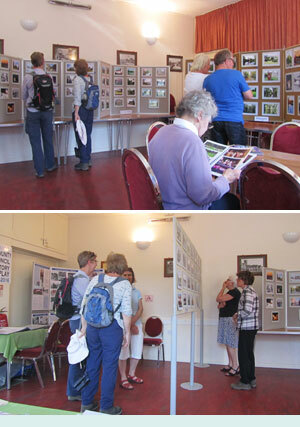 All the entries are on display on the May Bank Holiday following judging, but it is felt that this is insufficient to do them justice so they have been included in the photo albums. Copies of these albums are available online - click on the images to view. 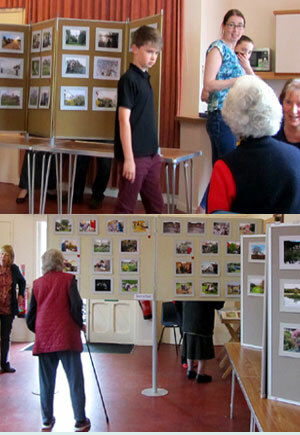 The photographic competition to generate images for the 2019 Nayland with Wissington Calendar took place on 7th May. There were 148 beautiful scenes submitted, making selection of just twelve scenes and a cover very difficult indeed. The judge, Geoff Meadowcroft, was impressed by the marvellous variety of picturesque views and village activities that had been represented and the interesting compositions captured. You will have to wait for the calendar to see the selected entries but shown here are an example of the other delightful images submitted and on show at the exhibition. As hoped, entries represented the different seasons with our range of weather conditions, from glorious sunshine to mist and snow. Locations ranged from village activities and events such as the Nayland 10K Fun Run, Church Fete, Open Gardens and erecting the village Christmas tree to parish landmarks, such as St James' and St Mary’s churches. 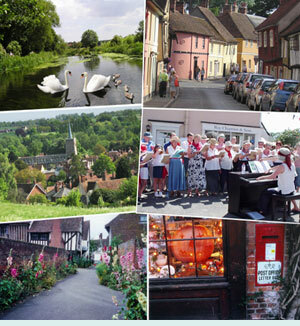 There were a variety of street scenes, views of the meandering river Stour, the countryside and farming views and some interesting architectural and natural features including the carvings in St James’ and the footbridge at Pop's Piece. Several people managed to capture spur of the moment scenes, and our feathered residents - the ducks, swans and resident goose on Caley Green . The images selected for inclusion in the calendar have been matched up with interesting old images of the village and historic detail is being added by Wendy Sparrow. The village calendar will be on sale at the the Flower Show on 4th August. 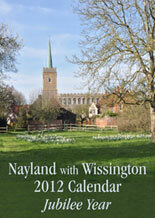 The photographic competition to generate images for the 2018 Nayland with Wissington Calendar took place on 1st May. There were 130 beautiful scenes submitted, making selection of just twelve scenes and a cover very difficult indeed. The judge, Geoff Meadowcroft, was impressed by the marvellous variety of village activities and picturesque views that had been represented and the interesting compositions captured. The photographs selected were submitted by Graham Wiles, Maggie Ryan, Julie Clark, John Dalton, Hazel Gardiner, Mike Hunter, Justin Dowding, Lorraine Brooks, Mandy Cook and Wendy Sparrow. As hoped entries represented the different seasons with our range of weather conditions, from glorious sunshine to mist and flood. Locations ranged from village activities and events such as the Street Fayre, Church Fete, Open Gardens and Court Knoll Archaeological Dig to parish landmarks, such as St James' and St Mary’s churches and Caley Green. There were a variety of street scenes, views of the meandering river Stour, the countryside and farming views and some interesting architectural and natural features including the horseshoe weir and the footbridge at Pop's Piece. Several people managed to capture spur of the moment scenes, such as a vintage car travelling through Mill Street, the ducks and resident goose being fed on Caley Green and traffic negotiating floods on the by-pass. The 2018 village calendar will be on sale at the the Flower Show on 5th August. In the meantime, don’t forget to keep your cameras to hand to capture scenes for next year’s competition. The photographic competition to generate images for the 2017 Nayland with Wissington Calendar took place on 2nd May. There were 138 beautiful scenes submitted, making selection of just twelve scenes and a cover very difficult indeed. The judge, Geoff Meadowcroft, was impressed by the marvellous variety of village activities and picturesque views that had been represented and the interesting compositions captured. The photographs selected were submitted by Graham Wiles, Anna Boon, Anne Spencer, Hazel Gardiner, Mike Hunter, Sybil Wade, Lorraine Brooks, Sandra Gibbons, Wendy Sparrow, Julian Baker and Mandy Cook. As hoped entries represented the different seasons with our range of weather conditions, from glorious sunshine to mist and flood. Locations ranged from village activities and events such as the Church Fete, Open Gardens, Flower Show and Remembrance services, to parish landmarks, such as St James' and St Mary’s churches and the Pound House. There were a variety of street scenes, views of the meandering river Stour, the countryside and farming views and some interesting architectural and natural features including the horseshoe weir and Anchor bridge. Several people managed to capture spur of the moment scenes, such as a helicopter visiting the Anchor Inn, harvesting the crops and scenes of traffic negotiating floods on the by-pass. The goose who has taken up residence by Bear Street bus stop was also a popular subject. There was a excellent display of photographs for this year’s competition to generate images for the 2016 Nayland with Wissington calendar. One hundred and twenty four beautiful scenes were submitted for judging, making selection of just twelve scenes very difficult indeed. The judge, Geoff Meadowcroft, felt the quality of entries improves each year and was impressed by the marvellous variety of village activities and views that had been represented and the interesting compositions captured. The selected photographs were submitted by Graham Wiles, Anne Spencer, Nigel Evans, Trevor Smy, Hazel Gardiner, Mike Hunter, Lorraine Brooks, Antony Day, Wendy Sparrow and Oliver Hughes, one of our young photographers. 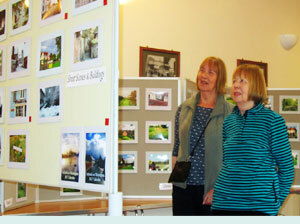 Following the judging in the Church Hall on 4th May, the doors opened for viewing. 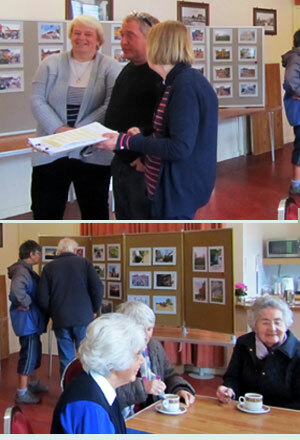 It was a very pleasant afternoon with visitors stopping to chat and have refreshments. Tha calendar is now being assembled and will be available to buy from 8th August at the Flower Show. The Community Council are grateful to the calendar team and helpers for their commitment to this project. Residents are reminded to keep their cameras handy to take photos for next year's competition. With all the attractive scenes within the parish, aspects of village life and variations in weather, seasons, and so on the scope for capturing different compositions is considerable.